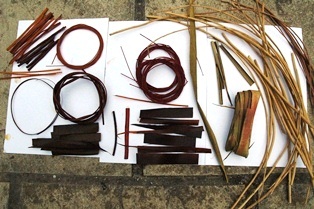 Although I have occasionally dyed cane, willow and raffia experimentally in madder and indigo dyebaths, I have not done extensive tests with a range of dyes on basketry materials. Recently, Sussex basket-maker, Jackie Sweet, spent a day here with me and we experimented with some natural dyes on willow, cane and Phormium tenax (New Zealand flax). Jackie Sweet is a talented and accomplished basket-maker, with a wealth of knowledge and experience, and her baskets range from more robust traditional English willow baskets to delicate woven containers, which are works of art in themselves. I have always loved baskets and I have some from many parts of the world in my collection, so the possibility of assisting Jackie in using natural dyes as part of the creative basketry process was something I was looking forward to. Of course, the natural brown, beige or tan colours of the basketry materials would mean that the dye colours achieved would not have the brightness and clarity of colours achieved on white or cream-coloured fibres. 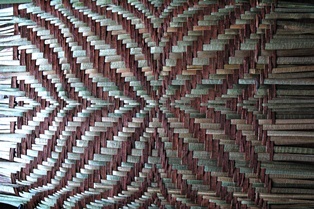 Jackie’s main aim was to achieve deep colours that would provide contrasts with the natural colours of the basketry materials and enable her to incorporate more elaborate pattern designs in her work. 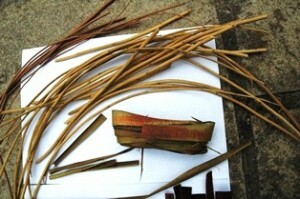 She had treated some of the willow and cane in alum beforehand, by soaking the materials in a solution of 10% alum. This meant we were able to compare the results on both alum-mordanted and unmordanted materials. I decided to experiment first with indigo, madder and onion skins, as I thought strong dyes would be needed, especially if the undyed materials were brown in colour. We also used iron and washing soda as colour modifiers. We simmered the fibres for about 30 minutes in the prepared dyebaths and the results were quite good, especially on the alum-mordanted materials. The iron and washing soda modifiers intensified the colours but the green I had anticipated from onion skins plus iron did not appear. Overall, Jackie was pleased with the results and decided to experiment further, possibly with some natural dye extracts. I suggested it might be worth experimenting with cool dyeing, using large plastic containers, as this would enable Jackie to dye larger quantities in a single dyebath. However, while cool dyeing should work well with indigo, I suspect strong dye solutions and considerable patience might be necessary for this method to work with other dyes. I also recommended extracting the dye colour by simmering first, so the dyebath would be hot when the fibres were added. All in all, I spent a thoroughly enjoyable day with Jackie and I look forward to hearing about her progress and to working with her again. The first photo below shows the undyed materials and the second photo shows the dyed materials on the left with some undyed materials on the right for comparison. 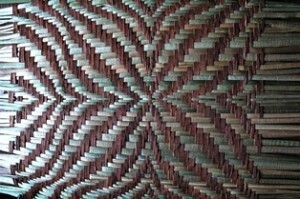 The third photo shows a woven design worked by Jackie using naturally-coloured and madder-dyed Phormium tenax. I call these experiments rather loosely "Anglo-Saxon style" because my aim has been to use only materials that would have been available during the Anglo-Saxon period, from around 450AD onwards to 1066. However, it is likely that some of the dyes and methods described here would have been used in Britain from even earlier times. It might be useful to write briefly here about "native" plants. The Natural History Museum in London has a website which provides lists of native plants, both in Britain as a whole and also restricted locally according to postcodes. The definition of a "native" plant is "a plant that was already present before the formation of the English Channel", which separates England from the European mainland. Under this definition, woad is not classified as a native plant but it is thought that woad was probably introduced here in Neolithic times with the development of farming. Madder (Rubia tinctorum) is also not a native plant but it was probably cultivated here during the later Anglo-Saxon period. However, wild madder (Rubia peregrina) and lady's bedstraw (Galium verum) are both native plants, as are weld and dyer's broom. The Anglo-Saxons used flax (linen) and wool from sheep in their textiles and they would have had a variety of fleece colours available so, by using fleece of different shades, some patterning of textiles could have been achieved without needing to dye fibres. As textiles decay and perish relatively quickly, there are few surviving textile fragments available for dye analysis, especially from the early Anglo-Saxon period. However, evidence also sometimes occurs in the form of plant remains in quantities and situations that indicate their possible use in dyeing. From the evidence available, the Anglo-Saxons seem to have used a limited number of dye plants and those they did use were mainly the classic traditional dyes favoured by British dyers today – madder-type plants, indigo (from woad), weld and dyer's broom, for example. These traditional dyes were certainly available during the period. As far as madder is concerned, there is evidence to suggest that madder (Rubia tinctorum) may have disappeared from use for a period of time following the departure of the Romans from Britain around 410AD. However, wild madder (Rubia peregrina) and lady's bedstraw (Galium verum) would have been available and Rubia tinctorum reappeared later in the period. This would seem to suggest that madder was imported by the Romans as a dried dyestuff, rather than being cultivated here. The Anglo-Saxons would have relied on the native madder-type plants until later, when madder (Rubia tinctorum) was imported, and there is some indication that madder was traded from France in the 7th and 8th centuries. Other dyes used by the Anglo-Saxons include tannin-rich dyes for tan and brown shades and also for dark grey and black when used with iron. Tannins are present in many plants and in oak galls, acorns, nuts and barks. However, it is not possible to identify by dye analysis the precise source of tannin in excavated fragments. For my experiments I used both oak galls and bramble leaves & twigs as tannin mordants. I also used alder leaves and twigs, oak leaves and acorns to dye browns, and black with the addition of iron. Clearly there would have been an abundance of tannin-rich materials available in the countryside, so these shades would have been easy to produce. Another tannin-rich dye plant is walnut, which is not native but was possibly introduced by the Romans and was certainly growing here by 1000. For purples there is some evidence that lichens of the species Ochrolechia and Umbilicaria were used and when treated in stale urine, which contains ammonia, these lichens can give purples and reds of considerable beauty and brilliance, although they do not have very good light-fastness. However, purple-producing lichens are found mainly in North and West Britain, on rocky coastlines or in hilly areas, so the fact that they do not appear to have been widely used may reflect their scarcity in many areas of Anglo-Saxon England. As far as mordants are concerned, there is some doubt as to whether Mediterranean mineral alum would have been readily available to the early Anglo-Saxons. Although the Romans would have probably brought alum for their own use, it is likely that, as with madder, it disappeared with them when they left Britain. So the Anglo-Saxons may have had to rely on alternatives until imported alum was more widely available later in the period. Even then, I suspect that dyers working in a simple domestic environment would have relied solely on what they could grow and gather locally. So what might have been used instead to fix the dye colours? Some plants, notably clubmosses, have the ability to absorb aluminium from the ground in which they grow, so it is possible that the Anglo-Saxons may have extracted aluminium from these plants. It is also possible that tannin from plants may have been used as a fixative and I have experimented with both clubmoss and tannin as alternative mordants. Iron would probably also have been used, possibly in the form of iron water or by adding scraps of iron to the dyepot. If iron pots were used as dye vessels, this may also have had an effect on the colours. I think the Anglo-Saxons' choice of a limited number of classic dyes – madder, woad, weld and dyer's broom – is also significant, as my experiments indicate that these dyes will fix without a mordant, although in some cases the colours may be less brilliant. However, the application of an alkaline after-bath, for which I used wood-ash water, results in colours almost as bright as those achieved from an alum mordant. 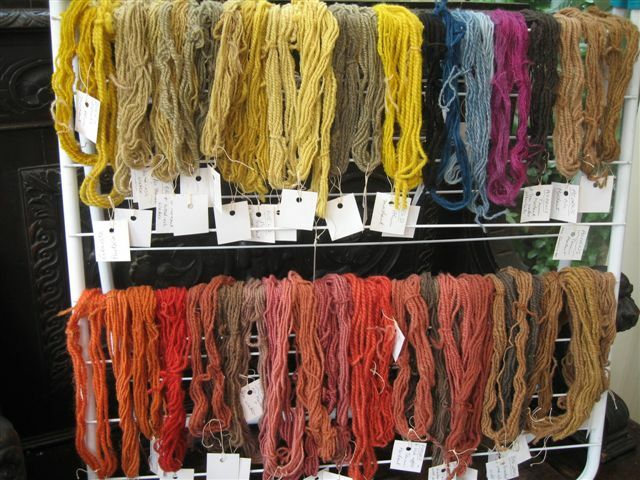 Restricting one's choice of dyes to those known to be reliable and to have good fastness properties is also a common way of working for today's natural dyers, many of whom rarely use more than ten different dyes on a regular basis. Indeed, some may use even fewer and, as a wide range of colours can be achieved by applying colour modifiers and over-dyeing, limiting the number of dyes used does not necessarily also mean limiting the range of shades available. What is crucial is selecting the appropriate dyes and the Anglo-Saxons would appear to have been well aware of this. There is no way of knowing whether the methods I have used in these experiments would have been those used by Anglo-Saxon dyers or whether the colours I achieved replicate those achieved by earlier dyers. But I believe it is likely that dyers in the past would have worked in very similar ways to dyers today and I have based my work on the available evidence of the materials used. For comprehensive information about early Anglo-Saxon textiles I would recommend "Cloth and Clothing in Early Anglo-Saxon England" by Penelope Walton Rogers, who has also written widely on textiles and dye analysis in many other publications. The bibliography to "Cloth and Clothing in Early Anglo-Saxon England" gives details for further reading. 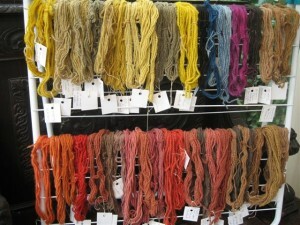 The photo below shows some of the skeins dyed using the dyes and methods outlined above. I will write in more detail about individual dyes in later posts.